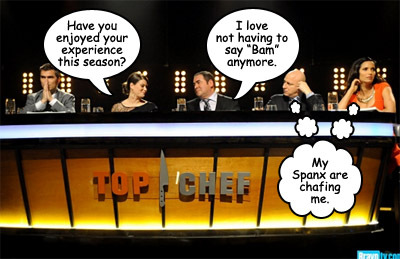 A Just Recompense on like the Super Bowl, but not: "Now we find out: each round will be voted immediately, and the first chef to win three rounds will win Top Chef. Sort of like the Super Bowl. For each round, first chef to win three votes wins the round. Which opens up all sorts of possibilities for manipulating the results to stretch things out and add suspense. It also cuts down on the discussion of the food, which Tom acknowledges in his blog. Sure they’d want to cut down on the descriptions of the food, since we’re viewers who can’t taste it and thus rely on the judges’ comments; they wouldn’t want to make it too easy for us. TC, Viewer Challenge Edition." Minxeats on sous: "Each of the finalists has three hand-picked sous chefs waiting for them. Brooke has chosen Team California--CJ, Stefan, Kuniko--for whatever reason. Maybe to save Bravo airfare? Kristen, on the other hand, has chosen the sharpest knives in the box, namely the last three contestants to be eliminated from the competition--Mustache, Sheldon, and Lizzie." Grub Street actually amused me a little this week: "Kristen and Brooke are both sweating while cooking their red snappler, a kind of fish. Brooke is pairing it with a 'pork cheek.' Between that and her pig-ear salad, I think Brooke would be a good person to know if you’re stranded on a desert island where the only thing to eat is a bag of pigs’ heads. Me, I would look at a bag of pigs’ heads and say, 'Nothing to eat here,' but Brooke would be like, 'I can make 30 entrees out of this one head, you idiot,' and I’d say, 'Well, excuse me for not knowing how to make a meal out of a dumb pig’s head,' and she’d be like, 'What’s wrong with knowing how to cook a pig’s cheek?' and I’d be like, 'Actually, I think it’s cool that you know all that stuff about food — in fact, I watched you on Top Chef,' and she’d say, 'I figured as much because don’t you remember how we were both on the Top Chef Cruise, which sunk, which is why we’re on this desert island in the first place?'" Grantland says what we've all been thinking: "How else to explain the near-disastrous decision-making on display? Just a week after I praised the veteran food competition for always considering contestants 'solely on the strength of their cooking,' the producers chucked their winning format in the garbage like so many burnt pig ears. In its place we were served something both unwanted and unexpected: an overheated, painfully dulled version of Iron Chef. Instead of excitement, it was hard not to feel sorry for Kristen Kish and Brooke Williamson, the two totally deserving, totally shellshocked finalists, as they were pitted against each other in a garish kumite that treated both their talents and the audience's comprehension the way a Vitamix treats an overripe tomato. Instead of cooking the 'meal of their lives,' the two gifted chefs were forced to cook as if their lives depended on it, racing breathlessly to push out 68 plates (!) of each course, and then stand, sweating like salted eggplants, while it was judged on a nuance-free up and down vote, separated by time and context from what came before or after. It was loud and it was dumb. Kristen won, but we all lost." Eater on baby mama? " I'm not sure how Brooke and Kristen worked out the sous chefs, but Stefan is on Brooke's team. He calls to Kristen. 'I chose light blue.' 'For what?' 'The baby's bedroom!' 'Shut up.' She seems genuinely uncomfortable with that joke. Maybe you took it too far, Stefan? I know I did. Sometimes, what people hate even more than being objectified is joke-objectified. What if she does want a baby with you, Stefan? Now your joke is mean. But who doesn't want a baby with you." Mary Alice from Charm City Cakes for the Baltimore Sun on formatting: "The entire episode was done in Iron Chef style 'live' from a Kitchen Stadium-esque set with a hooting and hollering audience. This episode was also edited in a frenetic, choppy way that left me edgy and confused. The challenges and dishes were not clearly introduced, so much so that I was pretty sure at one point that I had missed the first 30 minutes of the show."